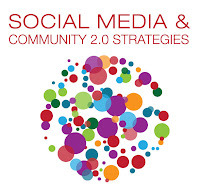 For the past 4 years, the Social Media & Community 2.0 Strategies Conference has been there to help you Translate Community Philosophy into Business Practice and Cash in on the Social Media and Community Conversations. This year we're taking it one step further by following the Continuing Evolution of Social Media. Leading industry professionals will be on hand to share in-depth case study perspectives focusing on the strategy, operations and results of social media. Join in on the conversation and follow the evolution taking place in the Social Media and Community space. Download the brochure for the full agenda and session descriptions. This year, there's only one place where you can find the tools and strategies you need to drive business through social media - Social Media & Community 2.0 Strategies. From social media newbies to seasoned veterans, this is the one conference that covers it all. Be a part of the evolution and register today! As a reader of the Community 2.0 blog, you can receive an exclusive discount 15% off of the standard rates when you register using priority code SOCIAL11BLOG2. If you have any questions about this event, feel free to email Jennifer Pereira, Online Producer, at jpereira@iirusa.com.